In February, Detroit officials confirmed that Cobo Center — named after Republican Mayor Albert Cobo, who left behind a legacy as a staunch racial segregationist — would be renamed. Though ultimately a business decision (Chemical Bank purchased the naming rights for $1.5 million annually for the next 22 years), the move was heralded by Mayor Mike Duggan as a Black History Month win. "[The] Cobo era was marked by the wiping out of African-American neighborhoods in the name of urban renewal," he said at a Feb. 20 press conference. "It was an era that displaced African-American families in a way that was discriminatory and callous and the tensions from those eras still reverberate in the city of Detroit today. I didn't believe that our civic center should, in its name, be celebrating that era." "We're going to start taking down red letters on the front of the building as soon as the weather breaks," Patrick Bero, chief executive officer and chief financial officer of the Detroit Regional Convention Facility Authority, told the Free Press. The event was originally planned to be held at a church in suburban Warren, but was moved after organizers said they needed a larger space to accommodate more attendees, citing an expected attendance of 1,700. One man who claimed to be one of the event's organizers told Metro Times it was moved to a safer location after threats were made online, but event spokeswoman Jennifer Lawrence disputed this, telling MT the group received "no credible threats" and insisting that the event was only moved due to space concerns. "Everyone has their freedom of speech," Lawrence previously told MT when asked about a planned protest outside of Cobo. "We have our freedom of speech, and we hold the right to refuse anybody, and we hold the right to throw anybody out. If they want to peacefully protest outside, that is up to them." Outside of Cobo, a few dozen peaceful protesters gathered in opposition to what they described as a divisive, fear-mongering campaign. "It is our belief that our diversity is our strength," protest organizers said in a news release. "As such, we recognize that it is our civic duty to combat division and hate wherever and whenever it rears its ugly head in our communities." 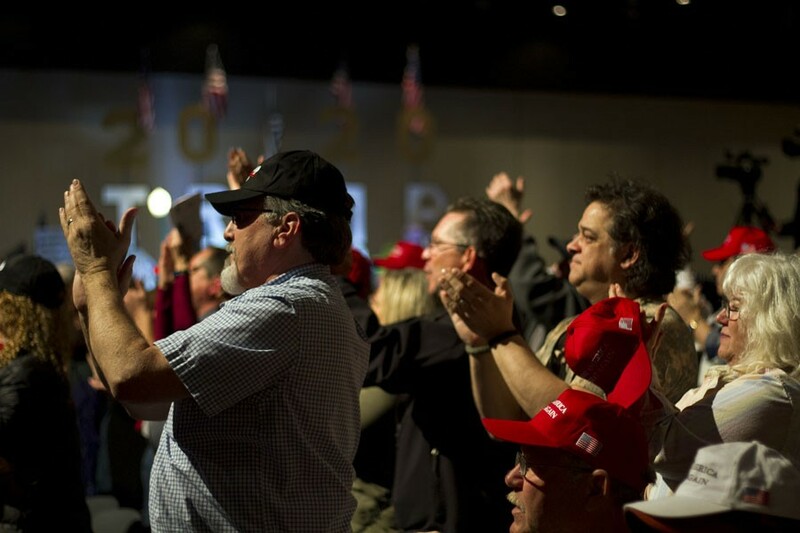 The decision to move the event to Cobo appeared to have perhaps been an overzealous one: By Metro Times' back-of-napkin math, we estimated the crowd was made up of roughly 700 attendees, or 1,000 less than anticipated. In Cobo's lobby, we spotted no less than a dozen police officers gathered in a circle, clearly bored. Inside Cobo, a welcome sign echoed Lawrence's earlier warning: "While we respect the right of expression, we reserve the right to remove any individuals or groups who interfere with program." Earlier that day, Trump warned there could be violent clashes with his supporters, telling Breitbart "I can tell you I have the support of the police, the support of the military, the support of the Bikers for Trump — I have the tough people, but they don’t play it tough — until they go to a certain point, and then it would be very bad, very bad." It wound up being a self-fulfilling prophecy. Organizers stayed true to their word, forcibly removing Metro Times reporter Steve Neavling at the direction of Lawrence, who sicced a burly, biker vest-wearing vigilante security guy on him for taking photos from an aisle, instead of from "the back where you belong." One of the underutilized Detroit police officers then intervened, ordering the rally's security guard to "get your hands off him." Ten minutes later, Neavling was allowed to return. During the rally, the speakers whipped the audience into further frenzy, suggesting illegal immigration was the greatest threat to democracy, blaming everything on it from the opioid crisis to high crimes rates (which have actually declined over the past few years). An "Angel Mom," a new term to refer to the mothers of children murdered by undocumented immigrants, was trotted out onstage with a portrait of her dead son. Singer Joy Villa, who turned heads at the Grammy Awards this year for wearing a dress with a pro-border wall message, assured the audience that most Americans support building a wall. "You might feel like a minority, but you're not," she said, this time sporting a red dress with black polka dots. "You're the silent majority." Polls show otherwise. A recent Gallup poll found that 60 percent of Americans are opposed to significant new construction on border walls. Speakers made other misleading comments, accused the "lying media" of spreading propaganda and told the crowd that undocumented immigrants "are receiving more services than you." That same day, a gunman opened fire at two mosques in New Zealand, killing 50 people. In his manifesto, he praised Trump as "a symbol of renewed white identity and common purpose." Steve Neavling contributed to this report.